FROM THE MIND OF TOM BELAND: YES... I ONCE HAD HAIR. YES... I ONCE HAD HAIR. 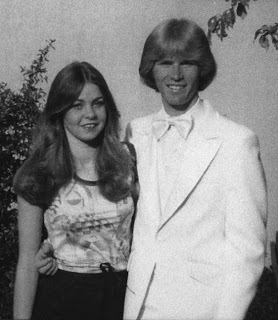 This is a photo from my prom night in 1980. I'm standing next to my sister, Susan... and, no, she wasn't my date. Stacie Henderson was my date. She kept telling her friends how great Tom was. Then, as I stood on her porch step to pick her up for the big night, she told me that Tom was cool if we stayed out late. It turned out that "Tom" was her boyfriend. A fact she never shared with me. And... yep... it sucked. The theme was "Don't Stop Believing" by Journey. I stopped believing in Stacy before we walked from her porch to the car. Dropped her off at home at 11pm. On the nose. Sighhh.... so many years ago. Check out that hair. I wasn't a jock, but I can tell you this... I was, without a doubt, the greatest dancer in Napa High. Patti Wilson liked to dance with me... and if you knew Patti Wilson, you'd be impressed. Anyhoo... just thought I'd post this. The old photos have been fun to look at. Dancer, chef, cartoonist... is there anything you CAN'T do????? I can't fit into that tuxedo. Ever. Man, I danced with Patti at a party once. It's a memory I still hold very dear to my heart. When we did powder-puff that year, I wore her cheerleader outfit. I cannot tell you what I did to that outfit... but it would make you blush. My God, was she insanely hot. Maybe she still is. . . I worked with her at the Warehouse record store on Jefferson back in the late 80's and she was stunning and was so cool to hang out with. I wonder whatever happened to her. I also lost touch with Troy Brown and I've never been able to find out where he is. and I mean it with much love and respect! AVENGERS CLASSIC #11 ON SALE NOW!